Life in China is so varied. I have been traveling to China for the past six years, and with each trip come new insights. China has the largest population of any country in the world. There are one billion three hundred million people that live in the country; one in every six people in the world lives in China. There are 56 minorities and hundreds of dialects spoken. Many people speak more than one language. Mandarin is the national language and has been a key to the growth of China because it is the main language that is taught in school and spoken in business. Over the past hundred years, there have been many changes to the basic family unit in China. Up until 1911, China was ruled by an emperor. In October 1949, Chairman Mao Tse-Tung declared a new country of China. Within the next ten years, families were encouraged to have big families. If you were a mother of eight or more you were called a super mom. You were honored with special privileges and were highly respected in the community. Chairman Mao felt that if China had more people they would have the advantage in the world. In the next 40 years, the population grew to more than a billion people. The family went though a huge change when the government made a new law that couples could only have one child if you lived in the city and two if you lived in the country if the first one was a girl. 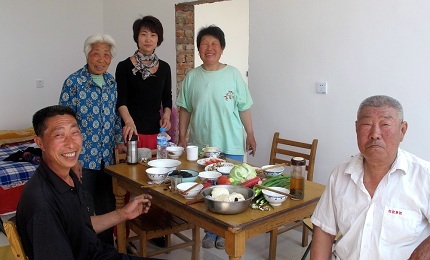 For millennia, the family unit in China has been the core of society. Much respect and honor has been given to the older generation. It is common for three and four generations to live together under one roof. It is not uncommon for three or four generations to live together under one roof. I have been impressed with the care and concern the Chinese give their elderly. In the parks I often see Chinese people pushing their parents in wheelchairs. The other day in the park I saw a wheelchair-bike combination. The wheelchair was in the front and the person who was pedaling sat just behind the elderly person pedaling the bike. What I have learned in my recent trips is that many young people have been raised by their grandparents. Both parents go off to work, and the care of the young children goes to the grandparents. When people on our tours express to me how tired they get when they care for their grandchildren, I always ask them how many they are caring for. They forget that in China there is one child in a family and that child has six people concerned about their care — a mom and a dad, along with both sets of grandparents. 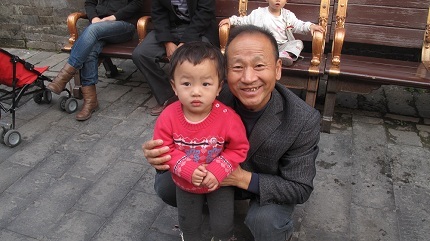 Four grandparents plus two parents are often responsible for the raising of one child in China. The little ones these days are often called little emperors and princesses because they get so much attention. I do not think that I have ever seen a shy child in China. They are ready to perform at the slightest encouragement. Even though the family has been changing over the years, I still see the family unit as a core to Chinese society. Despite all the changes, much love and care is still going into raising the next generation. This special offer includes Dian Thomas' Holiday Fun Year-Round and Fun at Home books plus her NEW DVD tape entiled; Creative Holiday Ideas with Dian Thomas. You’ll love the holiday ideas in the full color books (nearly 400 pages). See the best of Dian’s ideas on the DVDs from her 30+ years on national television! Her warm, energetic personality comes to life on your screen. Regular $59.98, this package is being offered for at only $24.99 — just in time for the holidays. Don’t miss this opportunity to create some lasting memories that you’ll cherish forever.